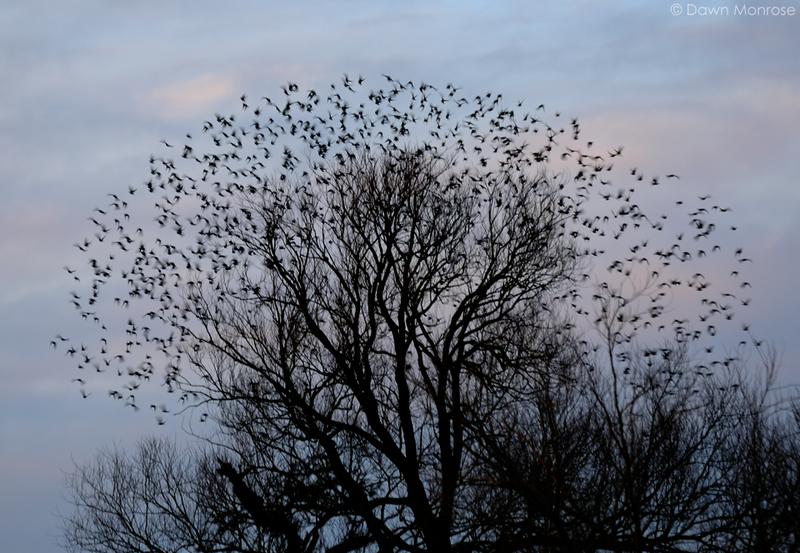 You may have noticed from my Facebook page that I have had the most amazing luck to find a Starling murmuration on my way home from work. 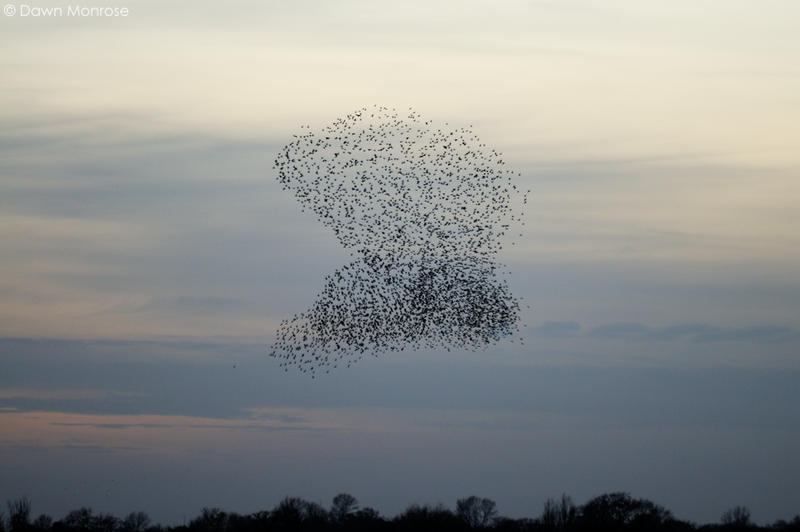 If you’ve never witnessed a murmuration before, I strongly suggest you go and see one next Winter as it is one of the most enthralling spectacles in the natural world. Over the last couple of months I’ve been trying to get some photos, which has not been that easy, but here are the results! 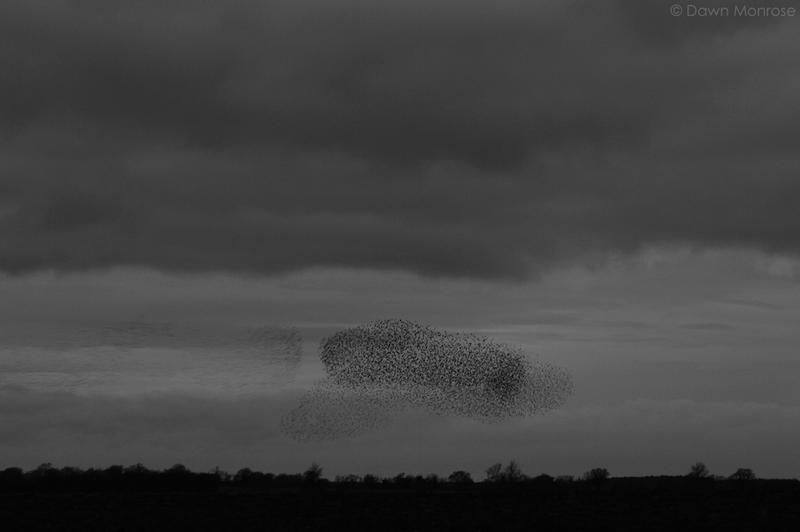 I was worried the flock would move on in the ferocious storms, but they remained, and in a break in the terrible weather I managed to get something a little clearer. 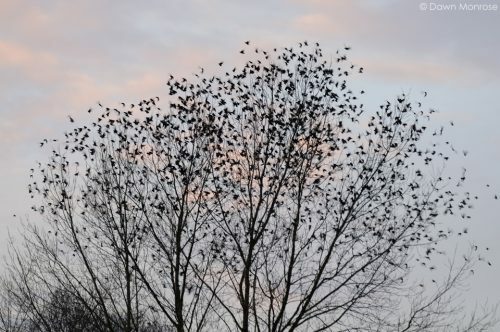 In the following weeks the flock grew larger, and on one particularly windy evening I witnessed part of the flock be blown across the treetops, dusting the dark clouds with pepper as the birds were scattered and harrassed by the gale. Fortunately calmer weather followed and gave me some better opportunities. 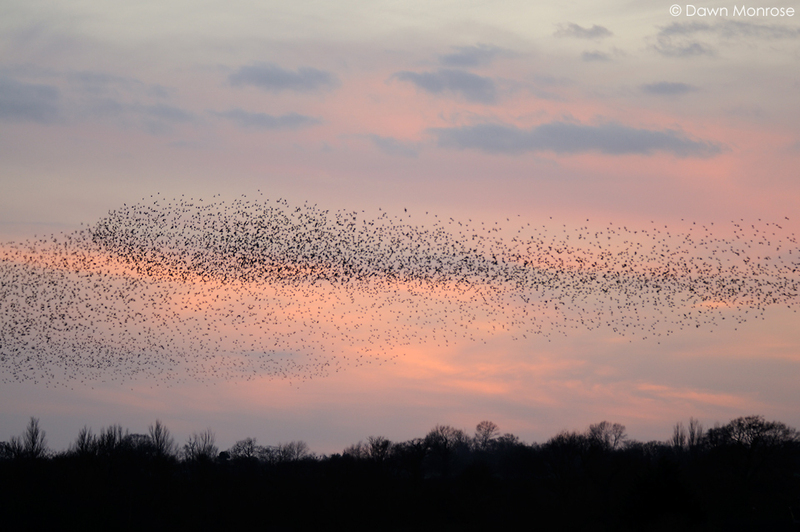 To watch thousands of birds twisting and turning in unison is truly breathtaking, and even when they simply sway back and forth across the sunset it is utterly hypnotising, and rather additictive watching and trying to photograph them. 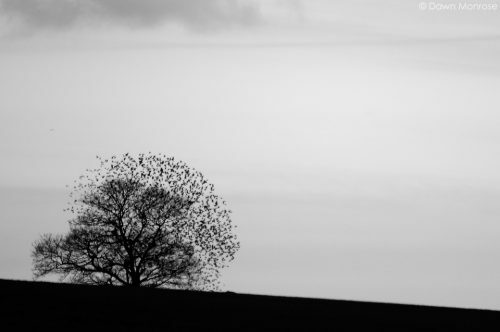 But when a predator arrives on the scene, the flock cuts in two, twisting into impossible shapes to avoid and confuse their assailant. 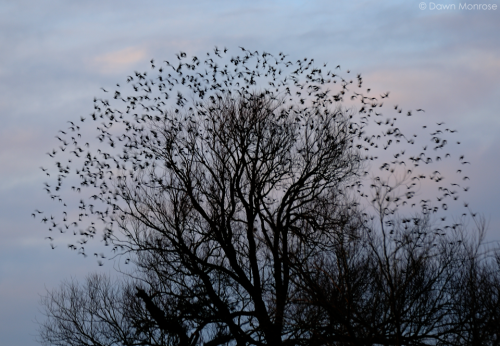 Like a shoal of fish the birds move in complete synchonicity, flashing black, grey, and gold as the setting sun catches their feathers as they swirl through the sky. 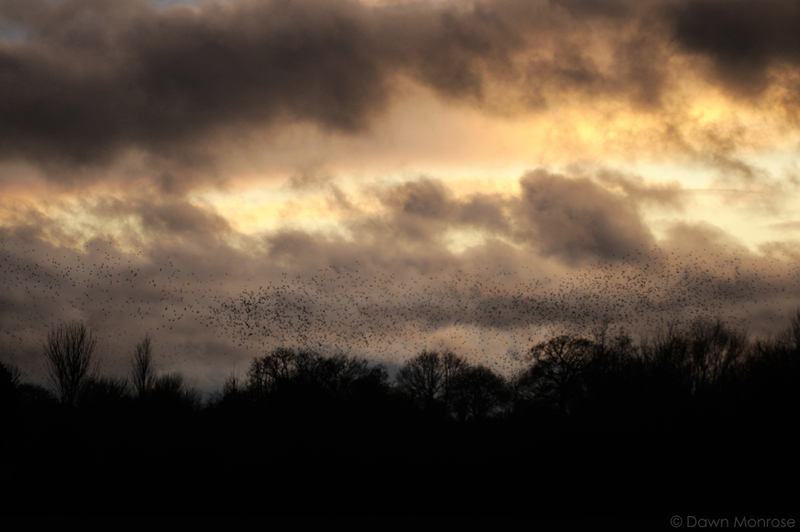 As the evenings grew lighter I found the birds gathering before taking to the skies. 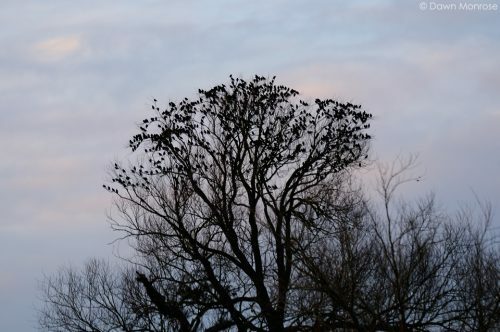 They perched together in the very tops of the trees, weighing down the branches, waiting for the right moment. 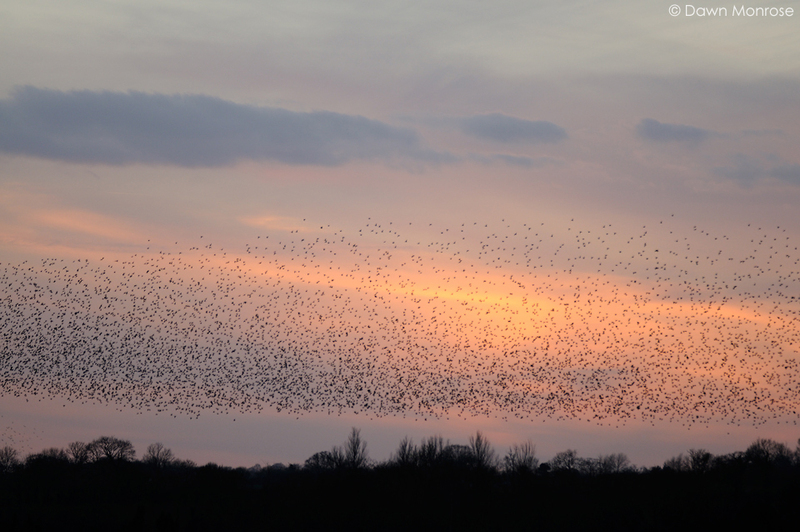 These pre-murmuration gatherings seemed to happen in a different location every evening. One night I found them much closer to the road, so I stopped to watch, and listen to them. The sound was incredible, the noise of a thousand voices, chattering, chittering together, filling the air with such energy. 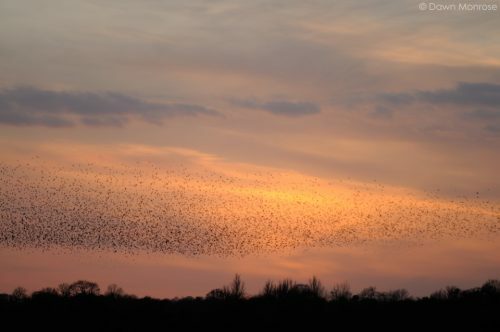 Then, in a single breath, hush descends through the flock in a wave. The world seems to stop in a silent, pregnant pause, holding it’s breath. 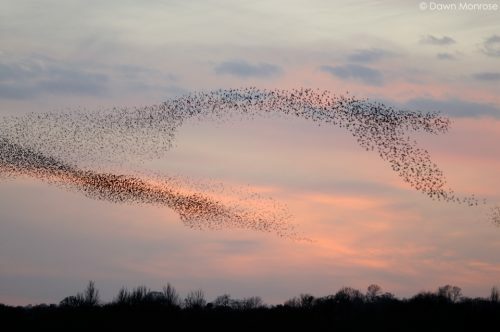 Then together, the birds lift to the sky with a rush of beating wings, the swoosh of air through feathers as they swish upwards and away towards the roost. It was fascinating to watch these birds, so in tune with each other that they seem to act as a single entity, how to they know when to lift off together? How do they fly in such close formation without crashing? My final image is probably one of my favourites. That moment when they all rise into the sky together is so spectacular, the trees seem to be adorned with a corona of birds, just for a fraction of a second. As usual; stunning pictures and commentary. Thanks for sharing your wonderful experience. Amazing!!! When we’ve witnessed murmurations it really does take your breath away,such synchronized beauty is incredible, plus the wonderful sounds that accompany them. 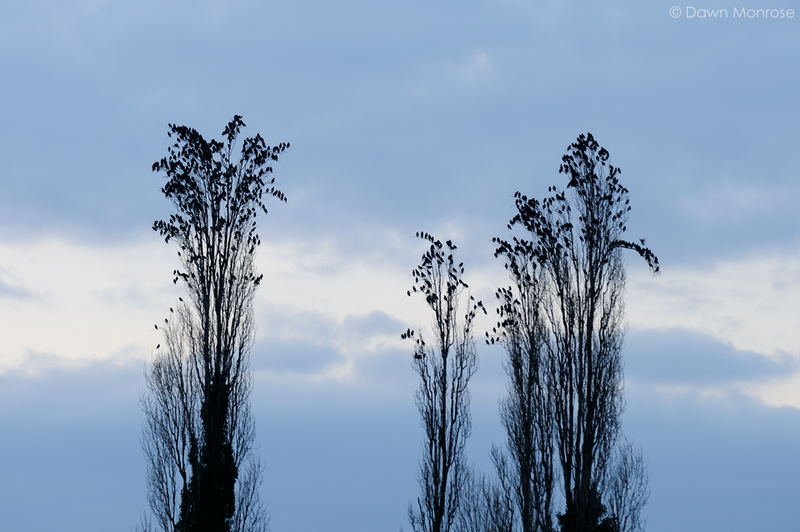 I particularly like the photos of the starlings on top of the tall trees, at first glance they look like the seed heads on top of reeds! Well done Dawn.